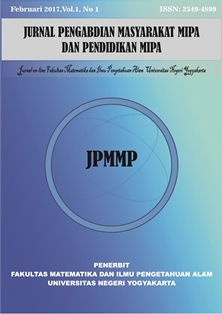 Jurnal Pengabdian Masyarakat MIPA dan Pendidikan MIPA (JPMMP) is a journal that contains the results of community service on mathematics and science including biology, physics, and chemistry in Indonesian language. JPMMP is published twice in a year, in February and December, by the Faculty of Mathematics and Natural Sciences (FMIPA), Yogyakarta State University (UNY). Jurnal Pengabdian Masyarakat MIPA dan Pedidikan MIPA is licensed under a Creative Commons Attribution 4.0 International License.